I hope all of you had a wonderful holiday and had a great time ringing in the new year. Like most of you, I compiled a list of resolutions for the year of 2016. But, when I was writing that list that we all know too well, I thought for this year I needed a real challenge. Something to test my will power and my never give up attitude. But instead of choosing something silly, I decided to take on the 365 Day Movie Challenge. Now for those who are unfamiliar with this 365 Day Movie Challenge, I am committing to watching one film a day, that I’ve never seen before. To some of you, this doesn’t sound very challenging. To you, nay I say. This is probably one of the hardest things to do. The 365 Day Movie Challenge will be a part of my life for one whole year. Every day my life for the next year will be revolving around the question of when can I sit down and watch a movie before the day ends. That not only intrigued me, it genuinely excited me. So, I collaborated with my right-hand mand and cowriter, Louie Coruzzolo. With him we listed out a set of rules that would make sure I wouldn’t cheat throughout the year, giving me the full effect of the 365 Day Movie Challenge. Also, it was during this conversation we realized 2016 is a leap year. This would mean I would actually have to watch a new film every day for 366 days. 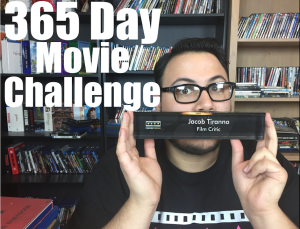 But, for the sake of the catchy name, we will still call it the 365 Day Movie Challenge. Below is a list of the rules that I must abide for the next year. I must watch a movie I’ve never seen before. Even if I had a seen a bit of it, it wouldn’t count for my movie of the day. I can not watch two new movies in the same day, and then use one for the following day. So if I watch two films, one is basically for my enjoyment. The movie must, at least, be one hour in length. Because I’m a huge fan of silent films, I will want to explore some that I’ve never seen before, but they aren’t as long as the average, modern movie. So, we concurred an hour-long will be the bare minimum. The day doesn’t end at midnight, but when I fall asleep. Sometimes I can be out working, or covering an event until 11 PM to midnight, so I wanted to be allowed to still come home and view a movie. However, I feel if a movie isn’t posted around 4 AM, I have failed. I’m assuming some of you aren’t too interested, thinking he’s a movie critic, of course, he’ll be able to watch that many movies. Well, I would say I am at the theater to review a film two times a week. I believe that’s an accurate assessment, of course, the weeks vary, but call it an average. That leaves me with only 102 films, meaning I would still need to watch over 260 to digest in my free time. In other words, this isn’t going to be easy. But most importantly, I want you to join me in my insane voyage! I want you all to enjoy this with me, and more importantly, give me the support I need to complete this year-long task. I will be updating my journey in a lot of different mediums. Every day, I will be tweeting which film I watched with a small review. You can follow me @JacobTiranno. I also will be logging my films in Letterboxd, an online movie journal for logging. Once a week, possibly twice, I will be posting videos on our YouTube Channel, Chasing Cinema. Lastly, I will be writing out updates randomly throughout the year to vent my feelings. But, I assume at least once every two weeks, if not more. Thank you for the continued support and wish me luck!